I spend most of my time with middle schoolers, high schoolers, and college-aged girls. And, I spend most of this time listening to girls (and boys) of all ages express their doubts and frustrations about faith and the Catholic Church. I love this because it shows me that doubters have detected an open table of communication. It shows me that I have given them enough space for them to feel comfortable telling me all of the reason why the religion that I clearly love so much doesn’t satisfy them. But most faithful adults spend too much time defending and not enough time listening. I don’t blame them for this. You defend what you love, right? Trust me, I’ve done my fair share of defending the faith and no, I have not always done so in love. So, how do we begin to develop this open table of communication? Create an open table through hospitality. I know what you’re thinking; What on earth does hospitality have to do with talking to young people about doubt? Hospitality has everything to do with providing a safe space for doubt. Young people need to know that you are not trying to change them. They need to feel the freedom of an open table. This will only happen through a practice of genuine hospitality. Meet young people where they are. In Scripture, we consistently see Jesus come and meet people where they are. In Matthew 14, the disciples are caught on the sea in the midst of a storm. Jesus comes to them by walking on the water and says, “Take courage, it is I; do not be afraid.” This is the same scene when Peter steps out of the boat and walks toward Jesus, sinking only when he takes his eyes off the Lord. We often skim over Peter’s words before he steps out on the water– words that reveal his doubt. Before Peter begins to walk on water, he doubts that Jesus is the one walking towards Him on the sea. He challenges Him saying, “Lord, if it is you, command me to come to you on the water.” And here we see Jesus meet Peter where He is. Peter needs proof and Jesus responds in love saying, “Come.” Jesus does not yell at Peter for his doubt. He does not preach to him. 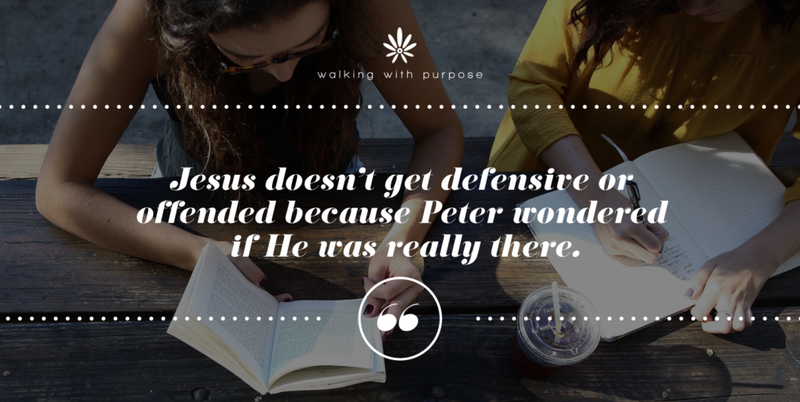 Jesus doesn’t get defensive or offended because Peter wondered if He was really there. Instead, He allows Peter to come to Him in the way he needs and in the time he needs. Then, Jesus catches Peter when he falls. Jesus cares about doubt just as you care about young people’s doubts. But what’s key is the way He responds. Jesus meets doubters where they are. He gives them space. He provides them with what they need. He allows them the time they need. He stands by them in love instead of getting defensive or offended. Encourage a relationship with Jesus Christ above all. Jesus cared more about people than He did about religious traditions. Willing to be unconventional and even offend the religious elite, He never lost sight of what was most essential. So why do we force young people into these little boxes labeled, “How to be a Good Catholic?” My guess is that it’s because you actually want the young people in your life to be “good Catholics” (whatever that means). But, I would also guess that if pushed, you would agree that what’s most important is that your child love Jesus and have a relationship with Him. And this is why we must encourage a relationship – not a religion – with Jesus Christ above all. My final point is this; when young people doubt, they are often actually wrestling with God– they are not ignoring Him. They are trying to figure out how to be in a relationship with God the Father. They are trying to figure out who Jesus is and what He cares about. And my hope is that this pursuit will take them on a beautiful journey into a deeper relationship with Jesus Christ. For me, this process took me away from the Catholic church for nearly a year. And during this time, most of the faithful Catholic adults in my life (who love me a lot) spent their time preaching to me and reminding me of why I should be doing x, y, and z to be a “good Catholic.” Let me tell you, at no point did being told where I was supposed to be make me run to that spot. But, I now love Jesus way more than I did before the doubt and wrestling began. And I’m still on the journey. So, when young people come to me with their doubts today, I let them vent. For as long as they need. Then, I remind them that nothing can make Jesus love them any more or any less. And finally, I try to help them figure out how to have a relationship with Jesus. I don’t always do this perfectly (because I think the Catholic Church is awesome and I want everyone else to see that too), but I’m trying. My prayer is that you too learn to provide an open table of communication for the young people in your life. Allow them to pursue Jesus at their own pace, with space and grace to make some mistakes along the way. Just as He did for Peter, He will catch them if they fall. PS: Email me any questions or thoughts you may have on this topic and tune into our Instagram Live on Thursday, March 29 at 10 AM ET! I will share three practical questions to ask young people when they are wrestling with their faith and I will answer as many questions as possible!